Event Description Art exhibition by Duffyleg at Wayward. 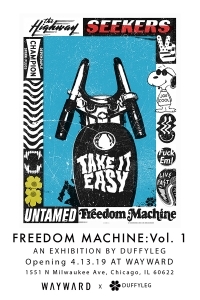 Freedom Machine: Vol 1 showcases art inspired by life on the road on The Great American Freedom Machine. Mixed media collages and sculptures crafted from the culture of anywhere but home. Come by to see the art, meet the artist, get a tattoo, hagve a beer, and have a good time. * 5pm-9pm: Vinyl records spun by Alex White from @whitemystery.